I’ve got a few tiny gift tags to share with you today, using the adorable Giggling Snowman from Mo’s Digital Pencil. I printed him really tiny, he’s about an inch and a half tall. Not wanting to waste my blending card, I put three of him on a quarter sheet of X-Press It. All three versions are colored with Copics, and I turned my gift tags into shakers. I used a die set from Lawn Fawn for the tags and the speech bubbles, and found some scraps of patterned paper from Maja Design that I put to good use on these. I added distress glitter in the shaker area, giving the feel of snow. The sentiment reads “Don’t peek! To be opened on Christmas Eve!” The speech bubble was just big enough for it to fit. 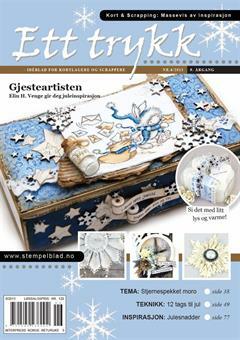 I added a few snowflakes diecut with a Marianne Design die before gluing a Kort & Godt pearl in the center of each. Since they’re gift tags, they need To and From on the back. I’ve stamped a few different Norsk Stempelblad AS ones with different colored inks, each to sort of match the rest of the tag and the snowman on front.